Have you ever wondered why you still sound like a “farang” after taking months and months of Thai classes? Have you ever had any problems not being understood by Thai people, or perhaps not understanding a word they say when they talk among themselves? No, Thai people aren’t speaking too fast. Just like how you wouldn’t want to speak English to them at 5 words per minute, you shouldn’t expect them to speak Thai to you the same way. Thai people aren’t using fancy vocabulary or complex grammar either. Most of them are just speaking naturally like how they would among themselves. But why aren’t you able to understand them and still speaking like a “farang”? Journey will teach you the realistic way that Thai people speak to each other, not Thai for “farangs” that no native speaker actually uses. 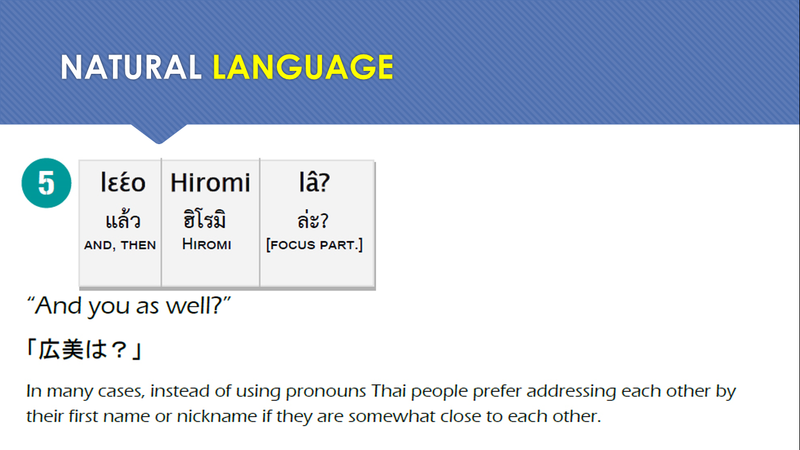 For example, Journey will approach the complex system of Thai personal pronouns by teaching you when to use formal pronouns like Phom, Dichan, Khun, and when you can just casually call yourself or others by name. Journey will not be afraid to take you through the mysterious territory of final particles, words that cannot be directly translated but convey the moods, expectations, and intentions of the speaker. “Lâ” for example, is used like a spotlight. When you put “lâ” at the end of a sentence, you shift the focus of that conversation. If someone asks you “sābāai dīi máy?”, the topic of the conversation is “you”. When you answer “sābāai dīi, lɛɛ́o khūn lâ?”, you’ve just changed the topic of the conversation from you to the person who asked you the question. Just like a spotlight shifting the focus from you to him or her instead.